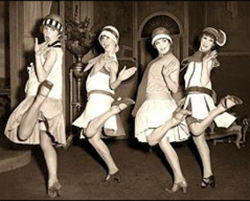 Fast, fun facts and Frequently Asked Questions (FAQ's) about 1920's Fashion history of women. What were the names of 1920's Fashion Designers? The names of the most Famous 1920's Fashion designers included Gabrielle "Coco" Chanel, Jeanne Lanvin, Elsa Schiaparelli, Sonia Delauney, Jean Patou, Madeleine Vionnet, Florrie Westwood, Norman Hartnell, Hilda Steward and Victor Stiebel. Who were the 1920's Fashion Icons? The 1920's Fashion icons included Hollywood movie stars such as Norma Shearer, Joan Crawford, Clara Bow, Louise Brooks, Marie Provost, Marlene Dietrich, Gloria Swanson and Colleen Moore. Other Fashion icons included Zelda Fitzgerald, Josephine Baker, other celebrities and members of royalty. 1920's Fashion attracted unprecedented publicity from the movie studios that publicized pictures and photographs of their famous movies stars who were idolized by millions of women who wanted to emulate the clothes worn by their idols. These women became the most influential of all the fashion icons of the era and their eager fans followed the latest trends and fashion styles. The exuberant and unconventional celebrities challenged the traditional styles worn by women by wearing short skirts, unrestricted clothes and make-up. Colleen Moore, a famous movie star of the era described the 1920's Fashion worn by the flappers as smart and sophisticated, with an air of independence and who were so casual about their looks and clothes and manners to be almost slapdash. 1920's Fashion represented modernism and women who were determined to free themselves of the shackles of the Victorian era. 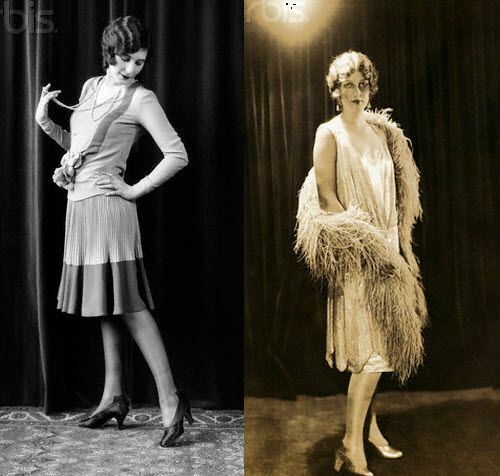 The photographs and pictures of the 1920's Fashion illustrate the hairstyles, make-up, fashion and clothes worn by the Hollywood movie stars of the 1920's - Clara Bow, Greta Garbo, Joan Crawford, Colleen Moore, Bessie Smith, Gilda Gray and Bebe Daniels. The short bob hair cut and style symbolized the independent and modern woman of the 1920's. There were several different bob hairstyles including the 'Dutch boy' bob, the Eton Crop, the 'Marcel wave', the Castle Bob and the 'Shingle' bob cut that contributed to 1920's Fashion. The 'Dutch boy' bob: The 'Dutch boy' hairstyle was straight, slick and smoothly edged to just below the chin line and featured bangs. The Eton Crop: The Eton crop a very short, slicked-down version of the bob style, famously worn by Josephine Baker. The 'Marcel wave': 'Marcelled' hair was a popular style for women's hair in the 1920s achieved by means of heated curling irons that could produce controlled waves quickly. The 'Marcel wave' was a waved version of the bob hairstyle. The Castle Bob: The Castle Bob, named after Irene Castle, was another version of the short cut bob, that featured with little curls on the fringe and at the bottom. The 'Shingle' bob cut: The 'Shingle' bob cut featured a look of rows of waves and layers over a closely shorn neck (resembling the row of sloping shingles used on a roof). 1920's Fashion History Fact 1: Trends: The trends and styles were highly influenced by art movements in the 1920's - Surrealism, Impressionism and Art Deco with strong colors and geometric shapes that conveyed the "modern" look. The Hollywood movies, the glamorous movie stars, the changing role of women, the rise in Consumerism and mass advertising during the prosperous period of the Roaring Twenties saw a fashion boom in America. 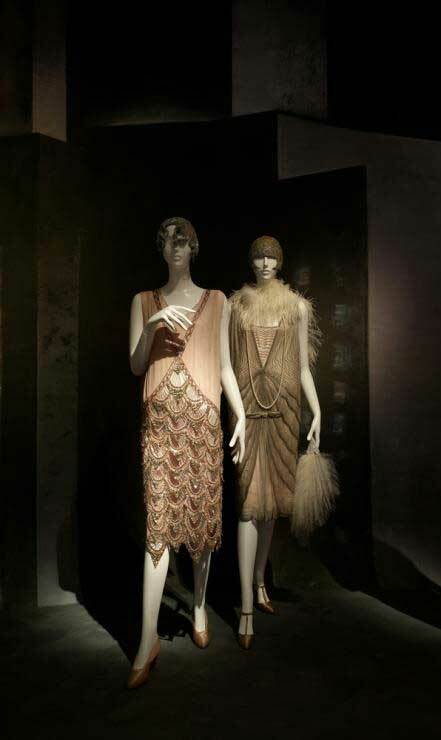 1920's Fashion History Fact 2: Mannequins: The use of mannequins became widespread during the Roaring Twenties in order to show women how to combine and accessorize the new fashions. 1920's Fashion History Fact 3: Fabrics: Expensive fabrics such as velvet, silk and furs were favored by the wealthy. Cotton and wool were in abundance, and cheaper. Synthetic fabrics such as viscose rayon, "artificial silk", and jersey were also used. Fabrics became more elaborate during the 1920s and were often printed with designs reflecting Egyptian art. 1920's Fashion History Fact 4: Fasteners: The old fashioned method of buttoning and lacing garments was replaced with easier, new fasteners. Hooks and eyes, buttons, zippers or snaps were all utilized to fasten clothing. 1920's Fashion History Fact 5: Rolled stockings: Flappers rolled stockings below the knee, and used garters to keep them up. 1920's Fashion History Fact 6: Cloche Hat: The bell-shaped cloche hat was a defining fashion statement in the 1920's. The name is derived from cloche, the French word for "bell". Cloche hats were typically made of felt and were designed to be worn low on the forehead. For evening wear, Cloche hats were made from beads or lace. By the end of the 1920s, it became fashionable to turn the brims on cloche hats upwards. 1920's Fashion History Fact 7: Chemise / Camisole: The chemise was a loose-fitting undergarment, that came to be known as a camisole, which replaced the tight fitting, constrictive corsets of the Victorian era. 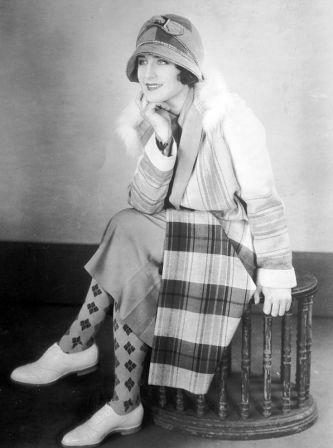 1920's Fashion History Fact 8: Scarves: Scarves were another 'must have' fashion accessory in bold, striking Art Deco designs. The scarf was rolled and tied around the head just above the browline and knotted at the side or the back of the head. 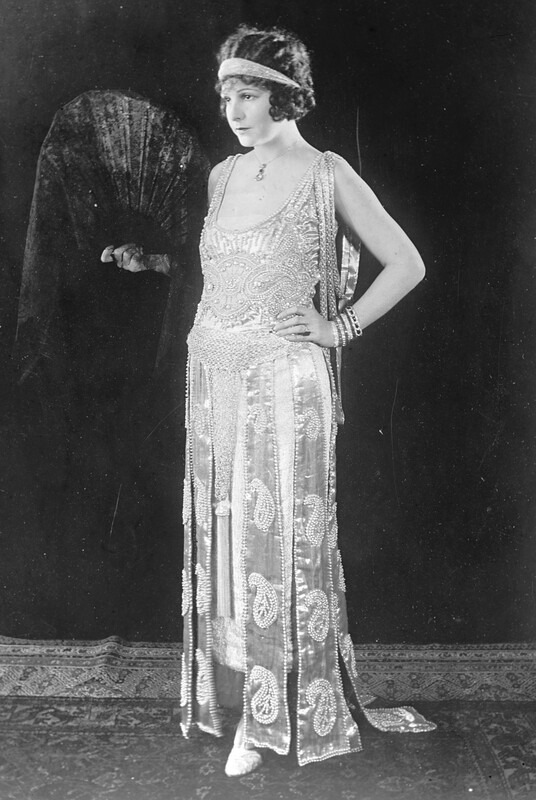 1920's Fashion History Fact 9: Egyptian Styles: The discovery of the fabulous tomb of Tutankhamen and the movies such as Cleopatra starring Hollywood actress Theda Bara led to the Egyptian style that influenced fashion and make-up. 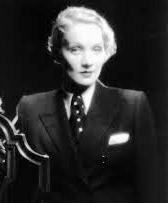 1920's Fashion History Fact 10: The 'Garconne' look and Coco Chanel: The boyish 'garconne' look ("boy" with a feminine suffix) and adoption of male clothing was introduced by fashion designer Coco Chanel and favored by movie stars like Marlene Dietrich. The liberating androgynous styles were daring and innovative. Coco Chanel is credited with liberating women from the constraints of the "corseted silhouette" and introducing sporty, casual chic to the modern women of the era. Coco Chanel used male themes like sailors outfits and mechanic's dungarees as inspirations for her fashions. Men's sweaters were worn with a belt around the waist, women wore tailored suits complete with shirt and tie. Short knickerbockers and baggy trousers also became in vogue enabling women to enjoy comfortable sports clothing for golf and and bicycling. Coco Chanel is also famous for popularizing the 'little black dress'. 1920's Fashion History Fact 11: Art Deco fashions: Art Deco fashions came into vogue using strong primary colors and sharp, geometric shapes to convey the "modern" look. Art Deco clothes also inspired sleek, streamlined forms to convey elegance and sophistication in women's fashions. 1920's Fashion History Fact 12: Knickerbockers: Amy Johnson borrowed the knickerbockers or jodhpurs trouser fashion from men as a comfortable and practical form of dress for female aviators of the era. The avant-garde style of knickerbockers, loose-fitting breeches gathered at the knee, were adopted as a fashion statement by women, often accompanied by a shirt and tie. 1920's Fashion History Fact 13: Bathing Costumes: Bathing costumes or suits became skimpier in the 1920's. Necklines receded and arms were exposed as were legs up to mid-thigh as shown in the picture of 1920's Hollywood movie star, Marie Provost. The swimsuits consisted of a long top that covered shorts, matching stockings were worn to complete the outfit. The most common fabric was a jersey material. Necklines receded from around the neck down to around the top of the bosom. The development of new fabrics allowed for new varieties of more comfortable and practical swimwear in the 1920's. 1920's Fashion History Fact 14: Coats: Wrap coats with fur accessories were very popular. The picture on the right is of the famous movie star and fashion icon Louise Brooks wearing a typical wrap coat with a fur collar and cuffs. Coats typically closed with just a single center button wrapped over to the right. The shoulders of 1920's coats were cut broad with voluminous arm holes, which intensified the look of ‘shapelessness'. Capes and fur coats (for the wealthy) were also in fashion. Real fur coats included mink. fox and seal fur. A fashion trend for both men and women were full length raccoon coats. 1920's Fashion History Fact 15: Shoes: The shoes of the 1920s featured closed toes and heels and focused on straps and ornamentation. There were three basic types of shoes: ankle straps (Mary Janes), pumps (no straps) and T-straps. 1920's Fashion History Fact 16: Galoshes: Rubber overshoes called galoshes were one of the odd fashion trends, or fads, of the 1920's. The galoshes had metal buckles, but they were rarely used. The galoshes were spread as wide as the tongue permitted, allowing the flaps to swish as the wearer walked. 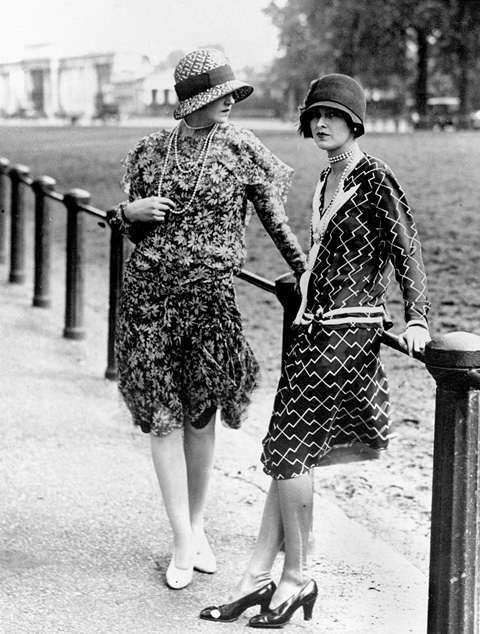 The term "Flapper" is believed to have derived from the rubber galoshes that "flapped" when walking. 1920's Fashion History Fact 17: Make-up / Cosmetics: Before the 1920's, make-up and cosmetics were not accepted in American society as it was associated with loose living. This changed in the Roaring Twenties as women copied the make-up and cosmetics used by movie stars. Women plucked their eyebrow, used eye pencil and applied kohl to their eyelashes, used lipstick to create an exaggerated lip line, nail polish and applied face powder and rouge (they also applied rouge to the knees!). 1920's Fashion History Fact 18: Jeanne Lanvin, Fashion Designer: Jeanne Lanvin (1867 - 1946) was known for her youthful, modern clothingand fashion styles that gave women freedom of movement. The Lanvin trademark was light, clear, floral colors and the use of complex trimmings and beadings. She was famous for her “robe de style,” the chemise and the Breton suit. 1920's Fashion History Fact 19: Robe de Style: The form and shape of the Lanvin 'robe de style' dress had a rounded neckline and a slightly fitted bodice with a full skirt. The Lanvin robe de style dress had a wide waist band, that sat lower than the natural waist. 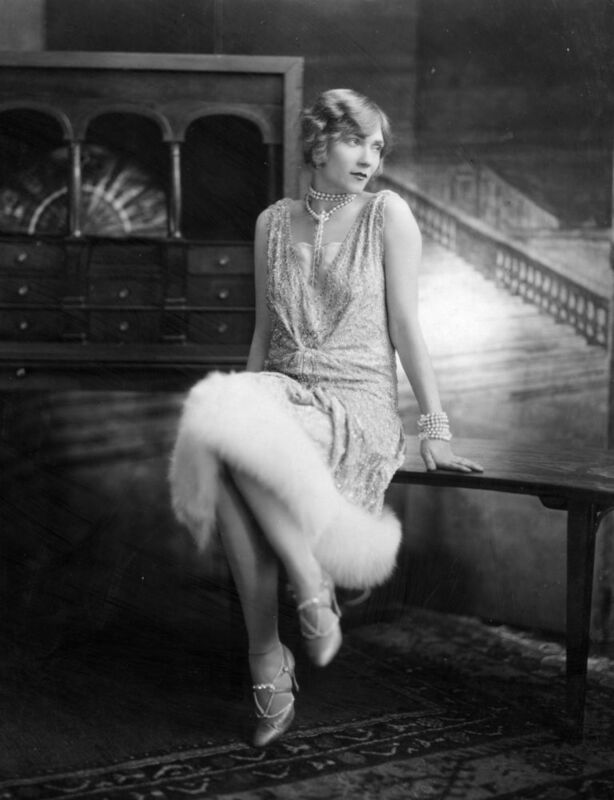 1920's Fashion History Fact 20: Chemise dresses: The chemise dress was synonymous with the 1920's flappers. The chemise-style were unfitted, and resembled a straight tube shape which fell in a straight line almost to the ankle with thin spaghetti straps. The dresses were simple as they had no darts, pleats or fitted seams. Whilst the style of the chemise dress was simple it was often adorned with sequins and beading. Panels were added to the dress creating the handkerchief style of hem. 1920's Fashion History Fact 21: Haute couture: The term 'Haute couture' refers to the fashion designers that create exclusive and trend setting fashions. 'Haute couture' also refers to the fashions created by the famous designers. Clothes produced by Haute couture fashion houses produce high quality, fashionable designs made with expensive, often unusual fabric by the most excellent dressmakers. 1920's Fashion History Fact 22: Jean Patou, Fashion Designer: Jean Patou (1880 - 1936) was a French male fashion designer whose styles were characterized by simplicity using clean lines and particularly suited to outdoor fashion and women's sportswear. He used geometric shapes and moved fashion towards the natural and comfortable. Jean Patou was the first fashion designer to popularize the cardigan. 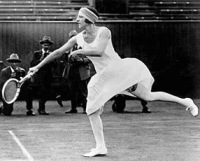 He was famous for his daring sleeveless and knee-length tennis dress that he designed for Suzanne Lenglen, the legendary tennis champion. 1920's Fashion History Fact 23: Elsa Schiaparelli, Fashion Designer: Elsa Schiaparelli (1880 - 1936) was an Italian fashion designer who became famous for her series of sweaters featuring Surrealist "trompe l'oeil" images. Trompe l'oeil means 'trick the eye' in French and Elsa Schiaparelli used optical illusions in her stunning fashion designs. 1920's Fashion History Fact 24: Sonia Delaunay, Fashion Designer: Sonia Delaunay (1885 - 1979) was an influential fashion designer in the 1920's who used Art Deco and Surrealist Poets as her inspiration. Sonia Delaunay created stunning fabric designs using geometrical shapes of squares, stripes, triangles and diamonds with bold colors on what she called her 'poem-dresses'. 1920's Fashion History Fact 25: Norman Hartnell, Fashion Designer: Norman Hartnell (1901 - 1979) was an English fashion designer who became the favorite of the social elite including the British Royal family. His designs were characterized by expensive and lavish embroidery that created a highly luxurious effect. He opened his London based couture house in 1923 and began his association with the royal family during the 1930s. 1920's Fashion History Fact 26: Madeleine Vionnet, Fashion Designer: Madeleine Vionnet (1876 - 1975) was a French fashion designer who created sleek, soft clothes and introduced the bias cut to 1920's fashion. The bias cut was a technique for cutting cloth diagonal to the grain of the fabric which enabled it to cling to the body whilst moving with the wearer. 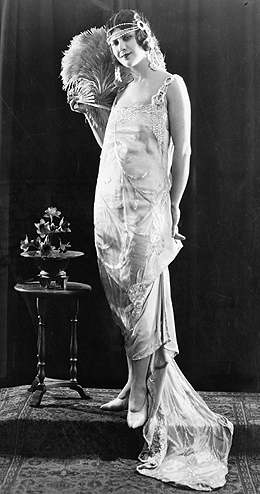 Madeleine Vionnet styles were characterized by the handkerchief dress, the cowl neck, and the halter top. The article on the 1920's Fashion provides detailed facts and a summary of clothing in the United States.. The following video will give you additional important facts, history and dates about the personal and political lives of all the US Presidents - a crash course in American History.